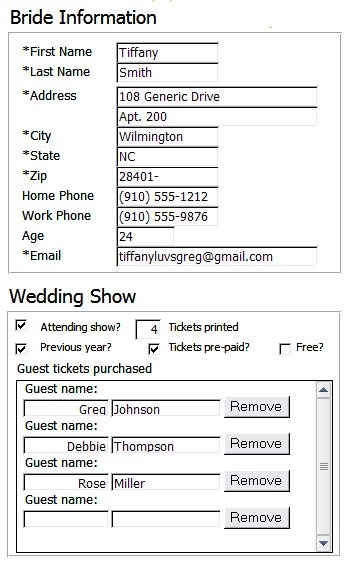 When you have customer information saved in a database, it's easy to create personalized tickets for both customer and guests. A registered customer can buy tickets to an event either immediately after registering, or at some future date after using a password selected as part of the registration. The site owner can easily monitor ticket sales through the MS-Access administration control panel. This portion of the customer's record shows the names of the guests she's bought tickets for, and payment status. These examples show how an online ticket sales feature, by promising discounts over the "at-the-door" price, encourages customers to pre-register, and pre-pay, online. By doing so, they are supplying valuable "opt-in" data that can be used for marketing purposes by the site owner. Here, a prospective bride registers for a wedding show, which allows vendors participating in the show to communicate with her about their services. Actual sales are integrated with an economical online shopping cart system, which includes a "download" feature for web-only products. Once the tickets are paid for, the system directs the buyer to a "download" page, which displays the tickets as seen here. Relationship marketing techniques depend on having good data about customers' interests and needs. Integrating a ticket sales system with data capture reinforces that relationship, giving the buyer personalized attention, and giving the site owner useful information about how to serve the buyer's future needs. 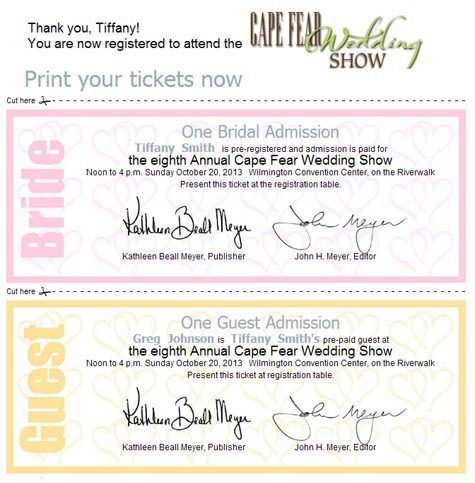 These personalized tickets, ready to print, were generated from a database record created by a customer.